The cause could be that the hard drive or internal drive is either damaged physically or its files are corrupt. In case the issue is with the hardware itself, we could either try changing the cables and checking if it works, else the hardware needs to be replaced. In case of eternal drives like a USB drive, to check whether the issue is with the system or the drive itself, try connecting the external disk to a different system and check if it works fine. If it doesn’t, try replacing the connecting cables (in case it uses USB port cables to connect to the system) and check if it works after that. Windows allows users to analyze issues with the hard drive using a command line. 3] Press Enter to execute the command. In case the outcome is ‘Bad’ or ‘Caution’, it refers to an issue with the hard drive’s physical hardware, which would have to be replaced. In case the outcome is ‘Unknown’ or ‘ok’, we could proceed to the next solution. The CHKDSK command helps check bad sectors in the hard disk and repair them if possible. 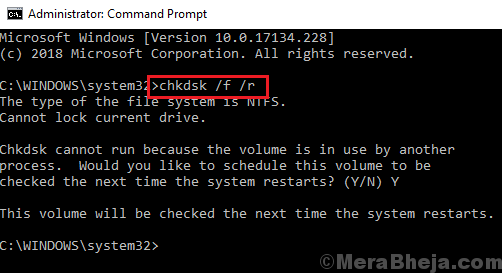 3] When you press Enter after the command, it would prompt whether you are sure that that you wish to run the CHKDSK command. 4] Type Y (to represent Yes) and press Enter. The CHKDSK scan would run after you restart the system. While we have little options with internal drives, we could try formatting external drives. 1] Insert the external drive (eg. a USB drive) and right-click on it. Select Format. 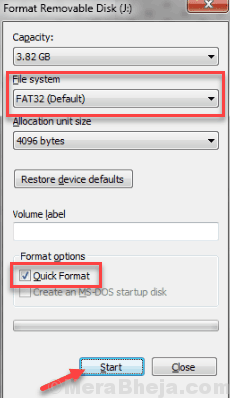 2] In the Format window, check the box for Quick Format and click on Start to initiate the formatting process. 3] Pull the USB or external drive out and reinsert it.